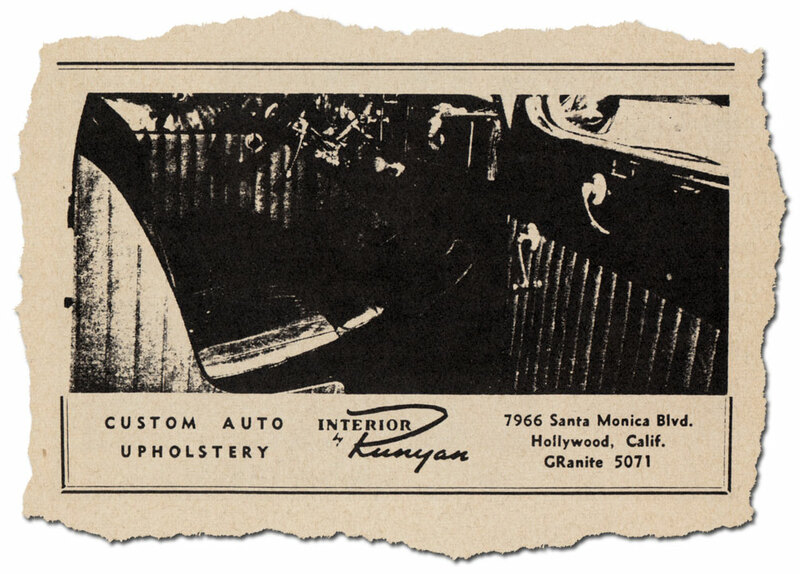 In the 1940’s and 1950’s some of the better know upholstery shop used small tags with their name or logo and address information mounted in the cars they upholstered. Let s take closer look at those tags. 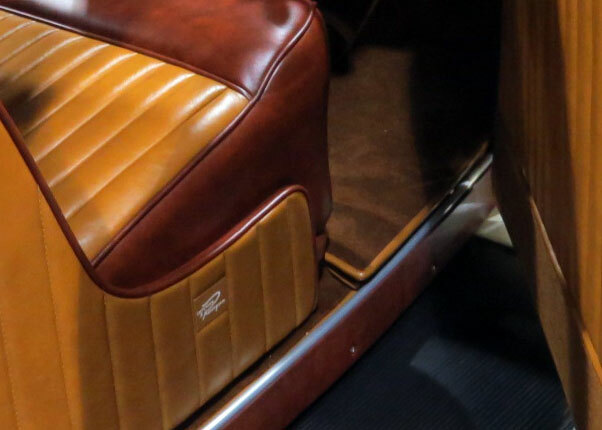 We know that the couchbuilders, who build complete custom made bodies on exciting chassies usually had some sort of tag, or crest on the body with the company name, or logo. As a sort of business card, making sure the people who looked at the car would see who was responsible for such beautifull work. And of course hopefully some people who see the work and the tag/crest might end up a potential client. 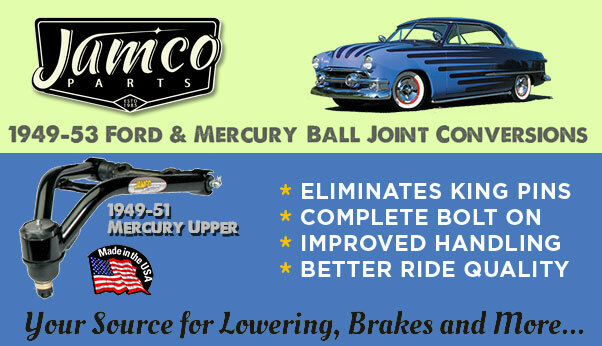 In the 1940’s some of the upholstery shops started to specialize in Custom and Hot Rod upholstery. Some of these shop also started to use small tags in the cars they had upholstered. 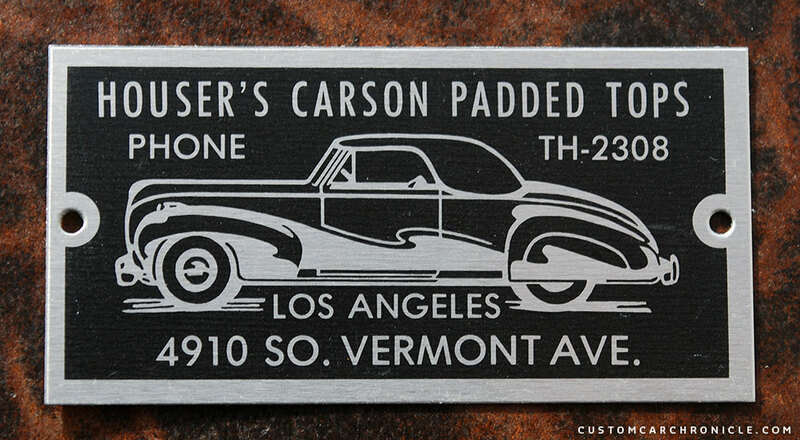 One of the more famous shops was the the Houser’s Carson Padded Tops shop in Los Angeles. 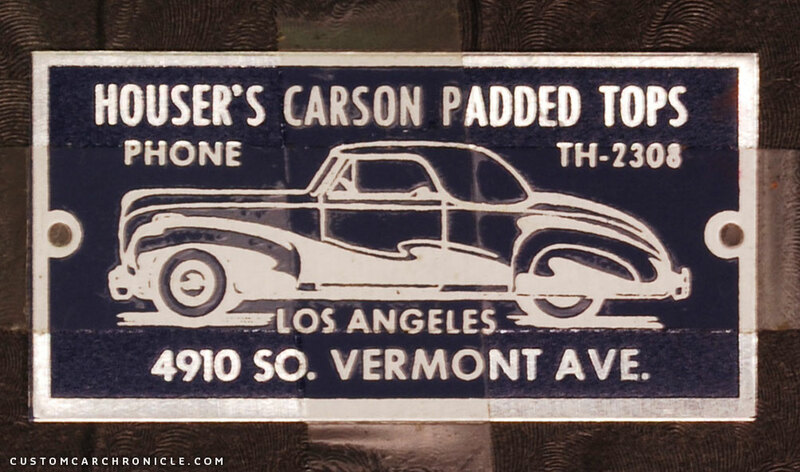 This shop created the famous Carson Padded tops, but also did full interiors and the tag they put in their cars is probably the most famous of these tags used by the custom and hot rod upholstery shops. 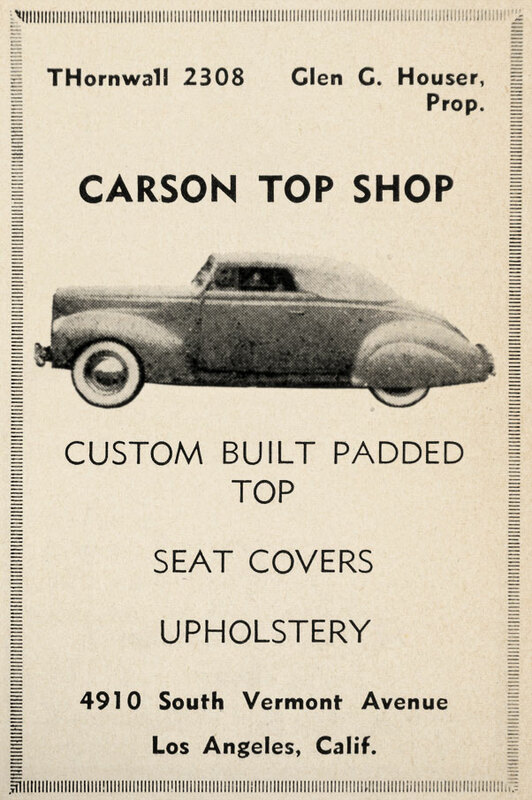 An early Carson Top Shop magazine ad. The original tag the shop had made was a very small metal tag. These original tags look to have been etched on one side leaving everything except for the letters, the cars illustration and border as a relieve section of the metal plate. This relieved section was painted either with black or a dark blue color, I have even heard somebody mention ehad seen one done in dark red. 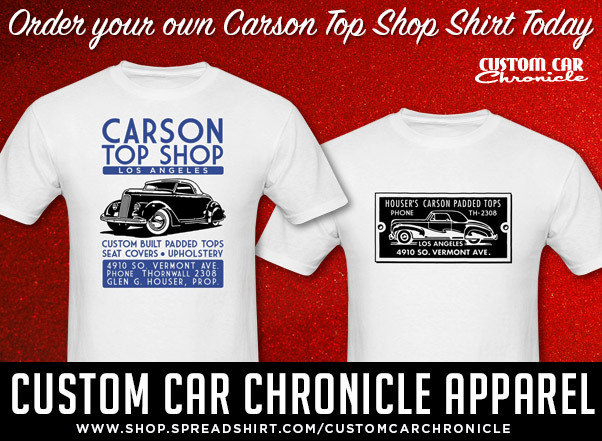 The most common place for the Carson Top Shop tag was in the middle of the top, right in the center above the rear view mirror. There it was held in place with two small nails. Sometimes the center of the header was needed for one of the hold down brackets, then the tag was positioned next to the bracket. In all my research I have never seen any other location being used. I am not even sure if cars that only had the interiors done by the shop, and not one of their padded tops, recieved a tag. So thismight have strictly been a tag used for a padded top. Perhaps any of the readers could shed a light on this. Another original tag in a bit worse condition comes from the Valley Custom Shop built sectioned 1940 Ford for Ralph Jilek. 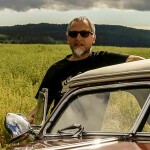 Tom Sewell restored the car and documented everything along the way. This photo shows the tagand its original nails that were used to mount the tag to the header on the Padded top. These two photos show the tak on the original position. Left of the tak was the padded top mounting mechanism, so it was mounted to the right of that. Notice how the tag was bend slightly to folow the shape of the wood header. In the early 1970’s the then owner of the Carson Top Shop was asked to restore an original Carson Padded Top. The work on the top was done, but then one thing was missing, the tag. None of the original tags could be found, so a new tag was created. Creating these tags asked for a minimal order of a lot. After the restoration project was finished some of these extra tags where given to friends, other where sold. These still can be found from time to time. The recreated tags are a bit different from the original once, small details in the size of the text. But the main difference is that the reproduction is silk screened on a metal plate, while the original was etched creating a relieved tag. 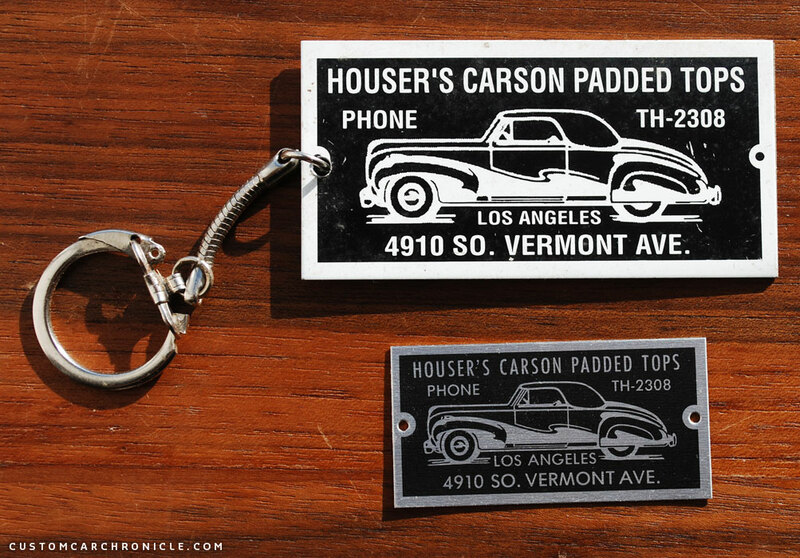 The three photos above show the replica of the Houser’s Carson Padded Tops tag that was created in the early 1970’s. The center photo shows that the black was silk screened onto the metal plate, creating no relieve section as the original had. Many thanks to David E. Zivot for suplying this sample. The tags are 50 x 25 millimeters in dimention (nearly two inches wide). 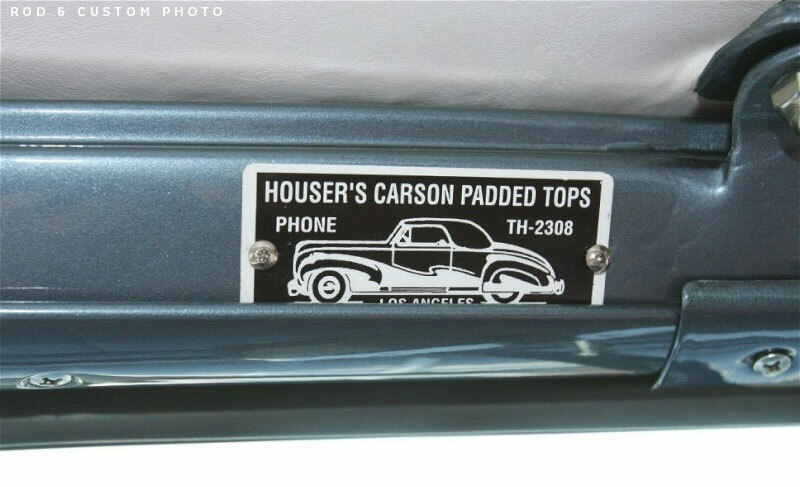 Jim Thompson used another replica Houser’s Carson Padded Tops tag in his recenly finished 1936 Ford Custom Convertible. This photo shows the replica of the original interior tag on the bottom (almost two inches wide) and one done as key-fob that is three inches wide (thanks to Tom Nielson for the Key-fob). The large one is similar to what Jim Thomson used in his ’36 Ford, and is made out of aluminum silc screened in white and black. 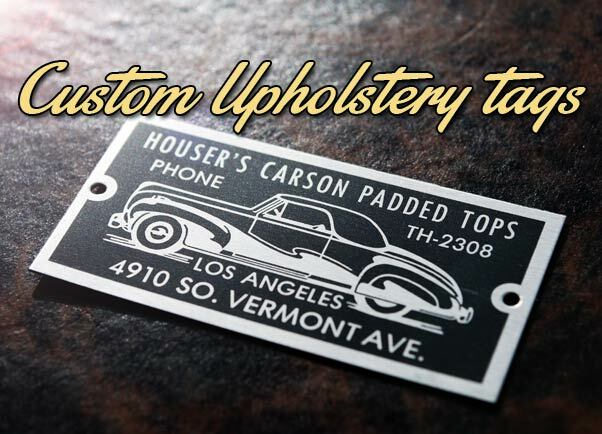 The first time I saw an photo of one of these Carson Top Shop interior tags waw when upholsterer Tom Sewell shared the restoration of the valley Custom Shop built sectioned 1940 Ford Convertible wit Carson Padded top and Carson interior with us. The restored interior has the tag located at the excact same spot it was put in by the Carson Top Shop in the early 1950’s. The C.A. Hall Auto Tops shop did a lot of Padded tops and Custom Car and Hot Rod interiors in the bay area, and for other Northern California based car owners and shops. This shop used an oval etched tag. 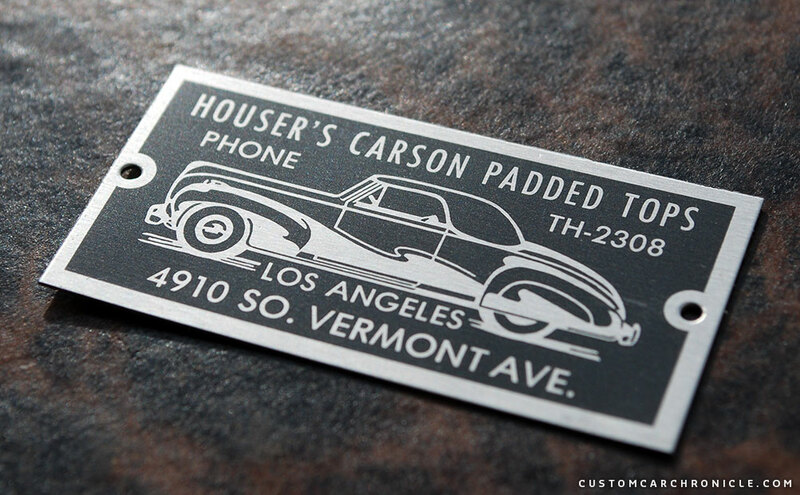 The only known sample of the original Hall tag we know of is in Ron Brook’s 1940 Chevy Convertible. Here the tag is also mounted on the front header of the padded top. The C.A. 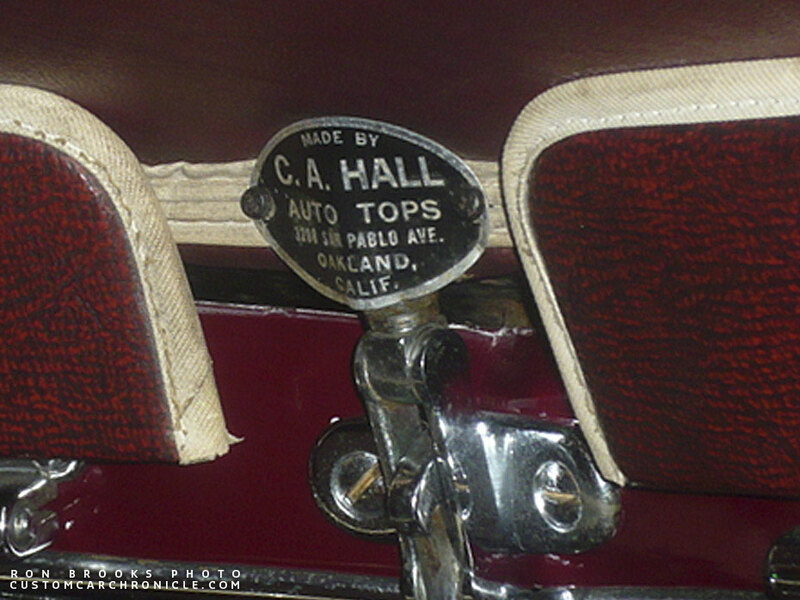 Hall Auto Tops tag mounted in Ron Brook’s 1940 Chevy Convertible. 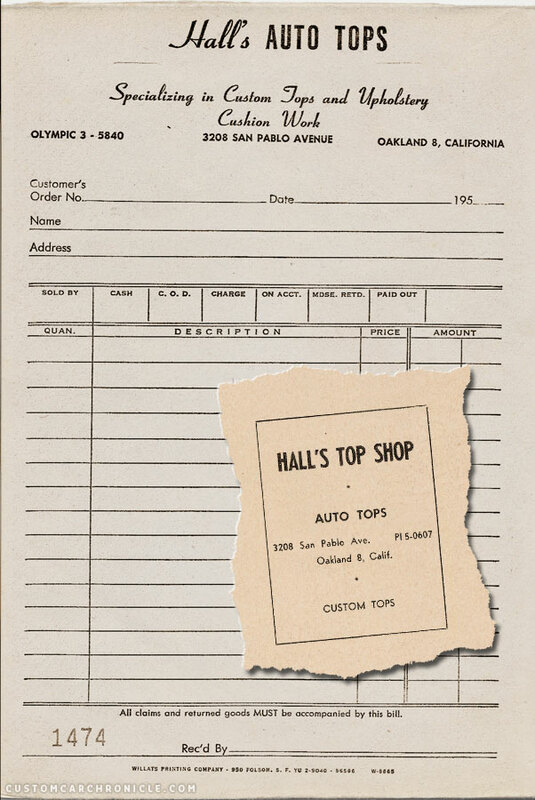 Hall’s Top Shop invoice form and magazine ad. Courtesy of Ron Brooks. 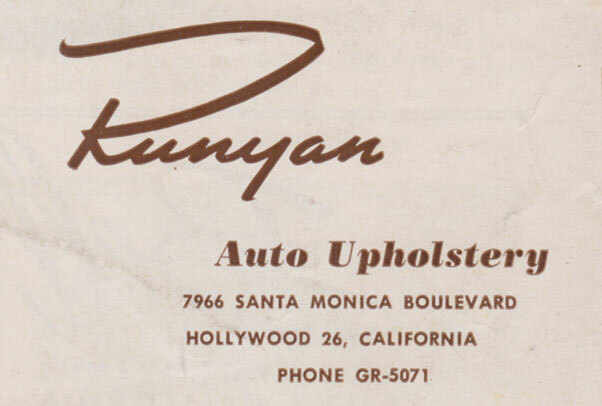 The recent restoration of the bob Pierson 1936 Ford learned us that the Runyans interior shop also had an interior tag. In this case two small tags were mounted on the seat side base covers. The South City Rod & Custom shop had these small tags recreated by Tony Parker who hand painted them. 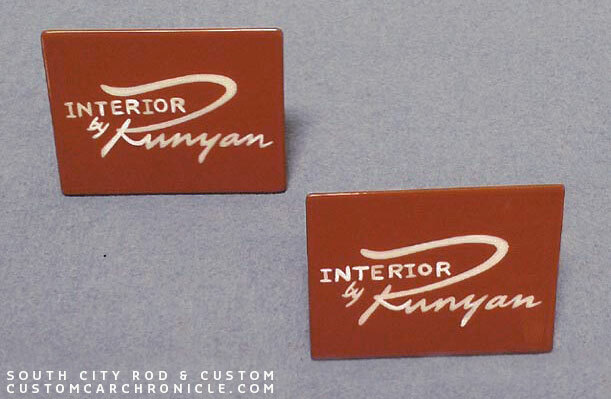 At this point we have no info on how these original Runyan Interior tags were produced. Tony Parker hand painted these small metal plates to recreate the original Runyan tags to go on the Bob Pierson 1936 Ford. These tags were mouned in a recessed setion of the tuck & roll panel covering the sides of the beach seat in the Bob Pierson 1936 Ford Coupe. One of the ads Runyan used showed the interior of the Bob Pierson 1936 Ford. We were unable to find a photo of an Gaylord’s interior tag. But according to Bill Gaylord the shop did use them. 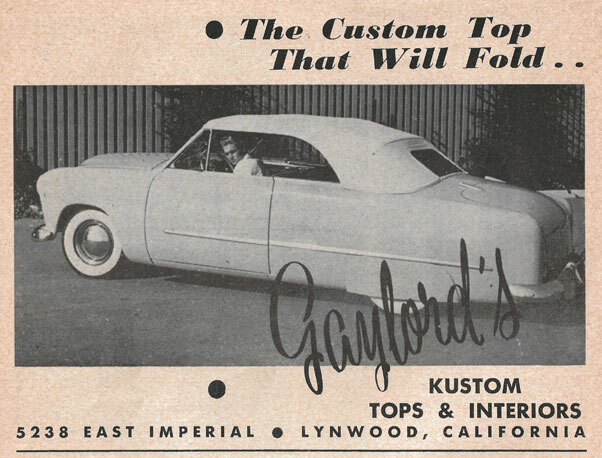 When Luke Karosi and Jeff Neppl interviewed Bill Gaylord for an full article on the history of the Gaylord interior for Kustoms Illustrated magazine. Bill mentioned the shop used such a tag, in fact people even came to the shop asking for the tag. even though they did not even have an Gaylord interior. The tags were given away to people like they were business cards. Sadly in non of the photos from the Bill Gaylord Collection this tag could be seen. And Bill also mentioned that non of them were left. We have no idea how these tags looked like, all we know is that the shop had them and used them on the cars they did. If somebody out there has a photo of this tag, or perhaps even has an original one, please let us know. We would love to add a photo of one to this article. This was one of the Gaylord’s logos used in the magazines back in the 1950’s. 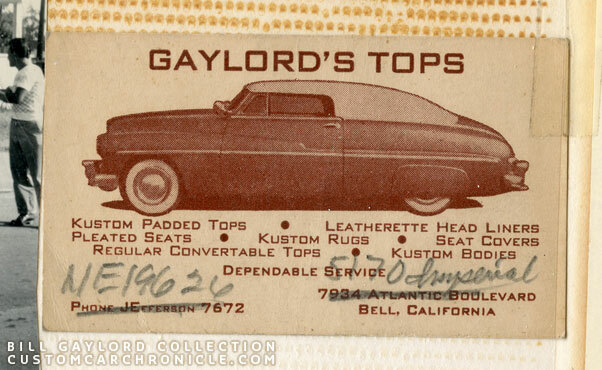 The Gaylord’s Top business regular card showing Bill’s personal chopped and padded topped 1949 Mercury. Some Gaylord ads used this skript type logo. But at this point we have no idea how the actual Gaylord’s interior tag looked like. 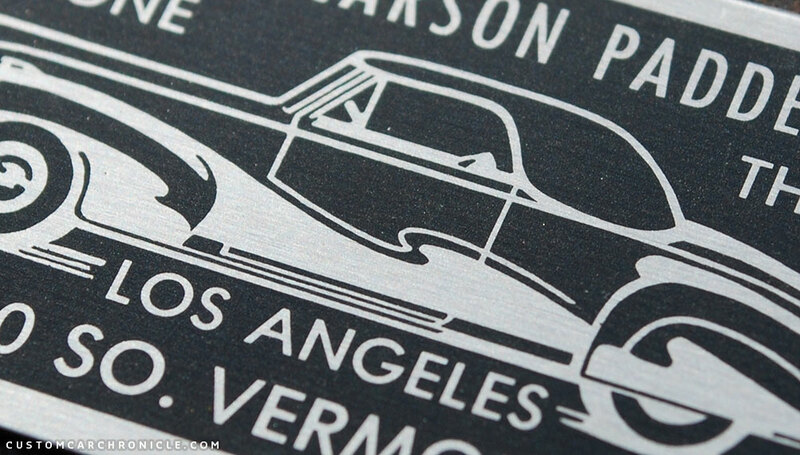 Details like this really make our desire for nostalgia even more pertinent. We can see the pictures and recreate the cars but when it comes to a tag we are unfamiliar with or know existed but cannot find a specimen of, we feel driven further to satisfy that desire. Thanks for the thought-provoking and interesting article.